Series 2 of Battle Beasts was fun for a variety of reasons, not the least of which were an increasingly zany batch of critters like Run Amuck Duck which... I have to say the color choices are confusing. Yellow? With blue and red? If you were dragged in to furniture stores in the late 1980s, you no doubt remember a lot of brass, a lot of green felt, and a duckload of ducks. Mallards, I think. (The ones that you keep in your house, but not near the bathroom sink.) 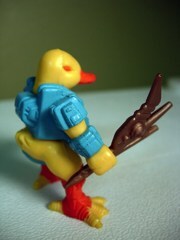 Anyway, ducks were everywhere, Disney launched DuckTales in 1987, so America was all about ducks in some capacity... so a Japanese duck toy didn't seem too wacky. I just don't get why it was yellow. The oddly named Run Amuck Duck is not easily abbreviated (Run D.U.C.?) but it does have some particularly interesting sculpted details. One hand is a standard, weapon-gripping hand which holds the bronze... thing. Depending on the angle at which you hold it, it's vaguely birdlike. 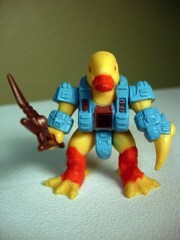 His left hand has been replaced by some sort of claw or blade, while his legs have robotic detail vaguely resembling a duck's webbed feet and actual webbed feet at the bottom. 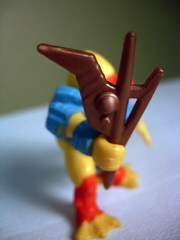 The armor itself has lots of sculpted robotic bits, and an unusually large codpiece. Is it an Argentine Blue-bill duck? It is entirely possible. He's clearly packing some heat down there. Like most figures in the line, he's fairly cute and stands around 2-inches high. 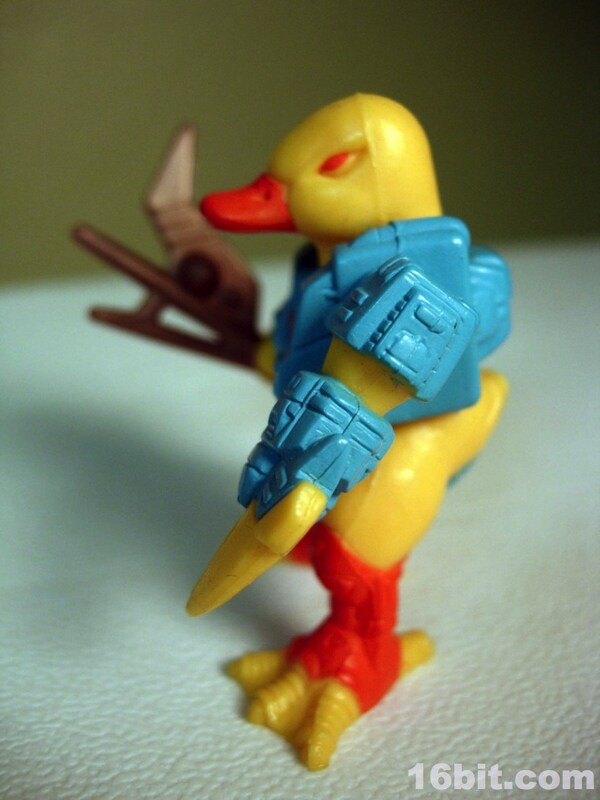 Given that the duck isn't exactly the kind of animal you think of when combat comes around, Takara's designers did a decent enough job creating a more warrior-like action figure, even though I can't honestly say that the sum of his parts make as much sense. 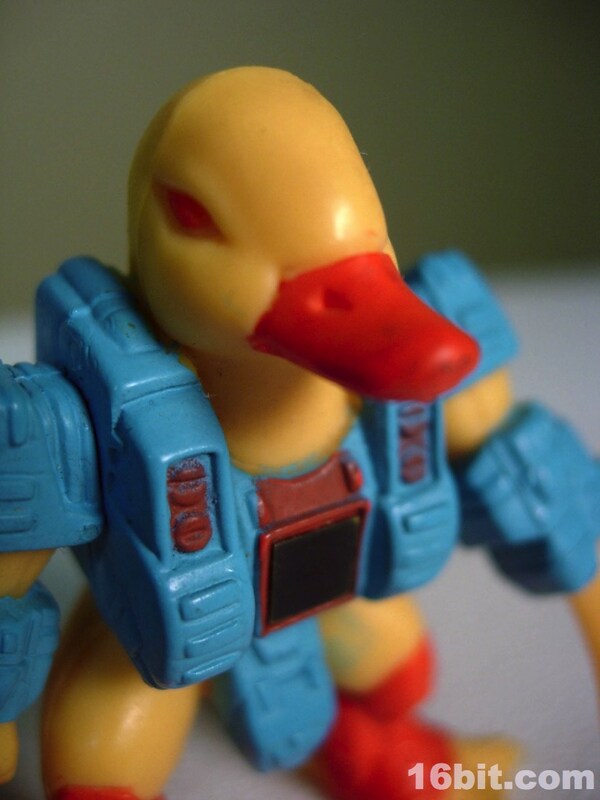 If (big if) they ever decided to reuse these molds again I think this would be a prime candidate for a repaint, either in black (like Daffy) or in some other more colorful spin. 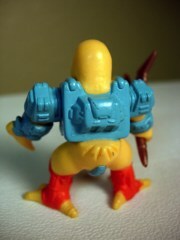 The detail is still quite good, though, and I almost forgot to mention his armor wraps around his lower torso with a hole in the back, letting his little feathered tail poke out just a little bit. It's a nice detail, and series 2 of the beasts seemed to have more of this kind of thing in there-- Powerhouse Mouse's tail sculpting is also notable, but we'll get to him later.